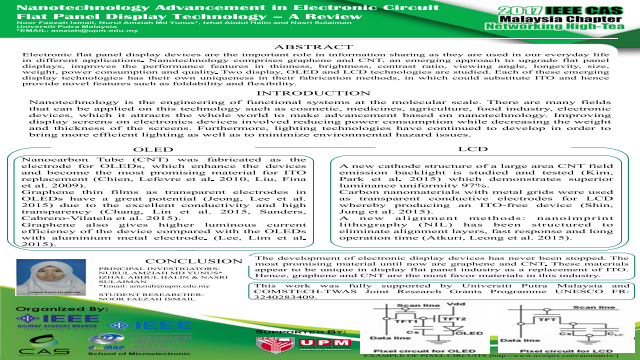 Abstract: Electronic flat panel display devices are the important role in information sharing as they are used in our everyday life in different applications. Nanotechnology comprises graphene and CNT, an emerging approach to upgrade flat panel displays, improves the performance features in thinness, brightness, contrast ratio, viewing angle, longevity, size, weight, power consumption and quality. Two display, OLED and LCD technologies are studied. Each of these emerging display technologies has their own uniqueness in their fabrication methods, in which could substitute ITO and hence provide novel features such as foldability and flexibility.